Theda Ruth Schutt, age 85, died January 29, 2019 at her home in Stillwater. She was born August 5, 1933 to Harold and Daisy (Reaves) Bechtel in Glencoe, OK. Daisy married Frank “Swede” Swalander while Theda was still a small child and he raised her as if she were his own. 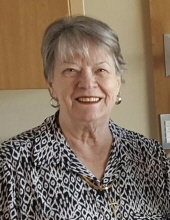 She worked at OSU as an administrative assistant, first in Financial Aid and later at the college of Home Economics, then retired from College of Education in 1999. Theda had a real passion for genealogy and she traced the family history for all branches of her immediate family, as well as the family histories for many extended family members and friends. Theda is survived by her son Bradley Schutt of Littleton, Colorado; her daughter Marianne (Randy) McFarlin of Ada; granddaughter Sarah Klepacki of Choctaw, grandson Kevin McFarlin of Ada, great-granddaughters Landry, Carter and Sutton, of Choctaw; numerous beloved cousins and many dear friends. She also leaves behind her special “girls” Pixie, Penny and Hope, of the home. Memorial services will be scheduled at a later date. Dighton Marler Funeral Home is in charge of arrangements. To send flowers or a remembrance gift to the family of Theda Ruth Schutt, please visit our Tribute Store. "Email Address" would like to share the life celebration of Theda Ruth Schutt. Click on the "link" to go to share a favorite memory or leave a condolence message for the family.